Normally in these pieces, I would go into the history of the founder and the way he/she built up their first remote presence offering. In this case, Dr. Yulin Wang (pronounced “Wong”) is far from an unknown quantity. So, instead of focusing on his back-story which is exhaustively captured in these articles such as Heathcare Purchasing News and TEDxAmerican Riviera), I spent more of my time discussing with him about the future of remote presence and where he sees the industry going. Dr. Wang got his Doctorate in Computer Engineering in the 1980s; at the time, microprocessors and computers were the hot thing. But, to Dr. Wang, coding algorithms to solve mathematical puzzles was one thing. Causing an effect in the real world was quite another, more satisfying endeavor. Yes, he could make an LED blink at a specific rate, but that end in itself felt unrewarding. So from his vantage point, robotics was going to be the next thing – enabling a person to impact the physical environment in a meaningful way. Making an LED blink – ehhh; making an arm move – now that was more gratifying. As you may know, Dr. Wang is the founder of Computer Motion, Inc. and after 12 successful years of working with those companies, he decided to strike out on his own in the guise of InTouch Health. From this writer’s point of view, robotics has fallen into three particular categories for the past 25 years – manufacturing, telemedicine and hobbyist efforts. Manufacturing has stabilized in the past ten years – with only incremental changes in technologies. Hobbyists efforts have proliferated with the advent of robotics kits, shared software like Player/Stage, Urbis and ROS and the free sharing of content on the Internet. Telemedicine has been the one industry where the cost of robotics is dwarfed by the benefit of having the right person at the right time in an emergency. As we have seen in DaVinci Robotics and other surgical solutions, telemedicine has been a resounding success for having tertiary care at the point of need. When I asked Dr. Wang about how he chose medical applications, he spoke to me about demographic trends and our upcoming need for the same “right person, right time” situation. The RP line of remote presence systems has been one where ensuring the “continuum of care” is maintained and the application of the expertise that may be too far away is available without having to include the cost of travel time. Our discussion of the RP7 and other models, framed by Dr. Wang’s unique way of explaining them, significantly impacted my initial opinion of them. When I first saw the RP line, I was struck by its large, almost yacht-like presence. I imagined that participants would react apprehensively to the device sidling up to them. However, as Dr. Wang began to go over the system design, I could see how the team’s brilliance in thinking through their own constraints worked well for the end product. The system is festooned with sensors around the base of the device – both a sonar array that determines the distance between the system and potential obstacles. Whereas the TiLR from RoboDynamics shows three to four sensors determining potential distance from the TiLR, the sensor array shows over 30 different data points, providing a cloud of understanding around the overall system itself. I was curious about the differences among the models, and he described the evolution of the RP7i. 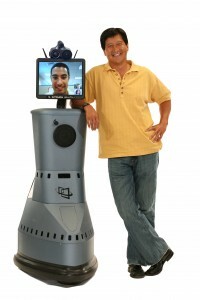 As he put it, remote presence is all about video, audio and mobility. So moving from the RP6 to the RP7 improved the video capability significantly by providing the double camera solution. The first camera provides a 170 degree field of view using a fish eye and allows the doctor/pilot to see all around them – removing the need for the navigational camera that systems like the Texai or the Anybots QB uses. The second camera supports a 11:1 zooming capability such that the remote doctor can see the pupillary response on a patient if needed. A nice usability aspect that InTouch provides is a seamless transition between the wide-angle camera to the direct zoom – seeming like one single camera in operation. On a personal note, I found the dual camera setup quite interesting since it provides the participant/patient a frame of reference for the “eyes” of the doctor and brought about some of the anthropomorphic characteristics Dr. Wang spoke of. In addition, the RP7 added a much more effective visual control mechanism – allowing for the doctor to move the head and focus much like an engineer does in a CAD system. 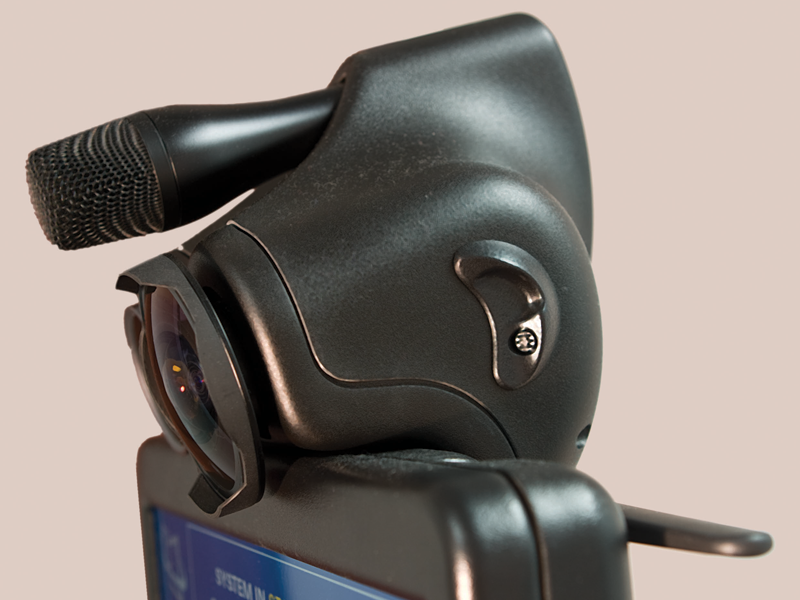 With a simple click and drag, the doctor can have an automatic zooming on the view of view; easily transitioning from a wide-angle to a tight close-up. Combined with the very smooth pan-tilt mechanism on the head of the device, it allows for significant control for the doctor/pilot which is not as easily found in other systems. Can I get my plastic surgeon to make mine look like that? The RP7i included a new feature – binaural hearing – by providing slight appendages to the back of the RP7 head. In fact, the appendages look quite like our own ears. And with a flip of a switch, the doctor (using a headset) can determine who is talking and where the speaker is in relation to the RP7i. I will describe more of the features of the RP7 series in another article, but what I found fascinating was how Dr. Wang spoke of how easily people connected with the system. When I mentioned my initial impressions about the RP7 as a “boat”-like system, he pointed out that the system has a general shape very similar to the human body – the torso has broad “shoulders”, a chest that slims to a thinner “waist” and then a wider base for stability and mobility. While they did not want to design it to look like a human being nor give it a monitor on a stick feeling, participants interaction with the pilot naturally have anthropomorphized the system. InTouch even promotes this connection by giving each system its own “name” emblazoned on a license plate on the back. What about the real test: how did real-live patients take to the system? Did they have any evidence that supported my concerns? From their many systems in the market today, Dr. Wang said that it has been a resounding success with almost no negative reactions. I was quite surprised, given some of my experiences in robotics, but Dr. Wang did what any good researcher would do – he quotes a study. 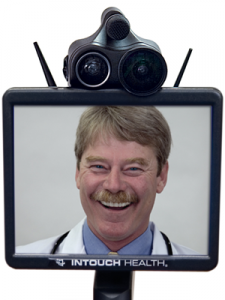 Johns Hopkins has completed a multi-center study on this very issue, investigating how patients would react to their own doctor in a remote presence system versus a strange doctor in person. Overwhelmingly they found that strangers in person were not what the patients wanted; seeing their actual doctor in “person” was preferable. Dr. Wang pointed out that in over 120K patient consults, the patients had a very enthusiastic response to seeing the RPS as a novel and different way of interacting, and given the prevalence of movies like Avatar and the benefit of the doctor being there at the time they needed them, such attention was welcomed, not admonished. Now, while seeing your doctor wherever you need them was beneficial, having the right person at the right time has turned out to be the best-selling point for the systems overall. One story he and his marketing director (Jennifer) told me was heartwarming and touching all the same. In January of this year, Bethany Miller – a very successful high-school woman’s basketball player – was admitted to the her local hospital in Jasper, Indiana experiencing stroke-like symptoms while at home after a practice. The ER doctors identified the stroke symptoms but needed a specialist to agree to the proper treatment. But the nearest specialist was almost one hundred miles away. Fortunately, Memorial Hospital and Health Care Center (MHHCC) had an RP7 in-house. Dr. Abu-Chebel, a stroke specialist from the University of Louisville Hospital beamed into the RP7 and was able to quickly diagnose, prescribe and treat Bethany – all without leaving his hospital 83 miles away. As I learned in an upcoming interview with Southside Hospital, a Long Island community hospital with a similar setup – in cases of stroke, time equals brain – and the sooner treatment is applied, the more brain is saved and the recovery is much quicker with a higher probability of full recovery. The day I interviewed Dr. Wang (in early March), he had just come from a press event at Bethany’s high school where Bethany, a full two months after the incident, made her appearance on the court, in front of her family, friends – and the RP7 with Dr. Wang beaming in to share in the good news. As we discussed his recent experience, I wondered how and where InTouch was going. With a revenue model that was based on high-quality remote presence at the price points he was describing, I was curious where the next steps were. He pointed out how customers were now using the RP7i and the RP-Lite for the “continuum of care” and saw other opportunities for the solution, this time in other mobile systems – like ambulances. The RP7-Xpress system would have similar characteristics as the RP7i, but placed at the point of care in the ambulances – where a tertiary care provider could be at the point of entry to the system even sooner in the process. Equipped with the same sensor systems, the RP7-Xpress would improve the long-term chances of survival for patients needing such help. Rather than focusing solely on robotics, Dr. Wang seems to have found a solid business model in the development of systems to support the extension of service to places not centered on a physical location. With cloud-based solutions supporting the entire workflow for doctors to handle their array of doctoring and administrative tasks, inTouch Health can help improve patient care and support the doctors, hospitals and patients along the entire continuum. But what about B2B, security, education, manufacturing, office remote presence? Dr. Wang says he have a think on this – but InTouch seems to have a lot on their hands already. Maybe they will leave the other problems to other players in the market. This entry was posted in Intouch Health, Remote Presence Systems, RP7i, RPS Companies and tagged Dr. Yulin Wang, InTouch Health, RP, RP-Lite, RP7-Xpress, RP7i. Bookmark the permalink.